Llanfwrog Church is situated on the top of a hill on the western edge of the market town of Ruthin. It still retains a distinct rural atmosphere and there are extensive views of the Vale of Clwyd and the mountains of the Clwydian range from the churchyard. Christian worship has taken place on this site since the 6th century, when Mwrog (a little known Celtic saint) first proclaimed the Gospel in this part of the world. Parts of the present church date from the 13th century. The building has been restored many times in its long history, the latest restoration being in 1999, when the church was made more 'user friendly' for the twentieth century. 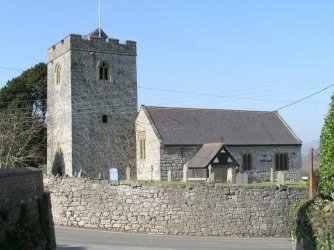 Llanfwrog is a small and friendly church and its worship is in an informal style which makes it easy for everyone to join in.